Here are the main video lesson modules you get in the program. 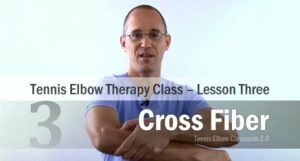 (There are two more not shown) — You also get access to the entire Tennis Elbow program, as well as several other elbow-related bonus video lessons, shown further below. Why bother learning the anatomy? Some of the problem is in your muscles – and some is in your tendons – It's good to know the difference between them, and it's important to be precise. You'll be more effective with this intro! 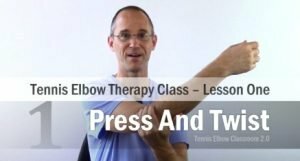 I'm going to help you do this by teaching you the three most powerful muscle and tendon self-massage techniques that I use in my practice every day to release this stuff in my Tennis and Golfer's Elbow patients. This is the simplest of the three therapy techniques - the easiest to learn and to do! - And it gets right to the heart of the matter. This technique is the most powerful way to release stubborn, chronic muscle tension and 'Adhesions' where the tissue is all stuck together. Most Golfer's Sufferers have TONS of this "stuff" in their muscles, in my experience - And I don't believe there's a way to break the cycle faster and more effectively than using this technique. This is also a great technique, (along with regular stretching) to use occasionally as a prevention tool - Even after your pain is long gone. It's the best way to avoid a recurrence if you ever feel things tightening up on you again. Golfer's Elbow Therapy Class 3: Putting It All Together With The "Pin And Soup Stretch"
It takes a little more practice but it's worth it! 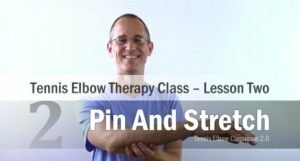 - It's a very powerful combination, and when you do this right at the tendons at your Golfer's Elbow spot, it can be an amazing feeling of release! But the way most authorities teach people to stretch is just plain wrong. It's risky - And it doesn't work very well. Once you learn the right way to stretch (and when, as in what sequence) I'm confident you'll see the difference and get a lot more out of stretching! Stretching is very important when you have Golfer's Elbow - but stretching correctly is even more important. Honestly, there is some work involved. This is not a brace, patch or cream you slap on and forget about. You need to work on your muscles and tendons regularly to help them heal. The good news is that in my 15+ years of specializing in treating these tendon problems, Golfer's Elbow is usually easier to treat and heal than Tennis Elbow, and I firmly believe this is absolutely the best program on the Internet to help you succeed at it. Each Video Has 4 Size Options For Downloading: Phone, Tablet, Etc. TV size 1080 x 1920 (HD) for a large monitor or TV. What Do Our Classroom "Graduates" Have To Say About Their Results? "Now I'm Back On Full Climbing Again!" I'm super happy with the program.... I found the videos super good and very detailed... It has also helped some friends of mine at the climbing gym. 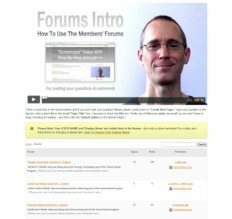 Your membership also features a members-only forum. You can ask me questions about the program - as well as talk with other members. All three options give you access to the Golfer's Elbow program video lessons (as well as the Tennis Elbow program) - And the other bonuses described above. You won't be able to log in! Please use any other browser: Chrome, Firefox, Safari, etc. all work! Backed By A 90-Day, 100% Money-Back Guarantee! I personally guarantee your 100% satisfaction with the video programs - If you're not satisfied with either program for any reason just let me know within 90 days of purchase and I'll refund your membership fee - No hassles - No questions asked! And here's the link to the refund form so you know where it is if you need it: Here's the refund form! Just choose an option above, click "Join Now" and I’ll see you in class inside. You don't have to wait for anything, just log in - You’ll be watching, following along and on your way to a faster, stronger recovery within minutes.